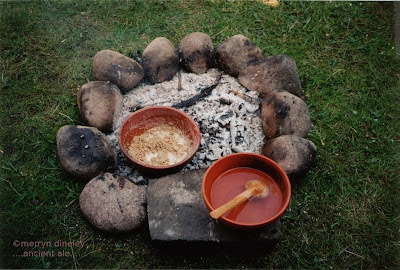 Once upon a time in the back garden, I started to do some archaeological grain processing experiments. It was the summer of 1995. I'd just finished an archaeology degree. Now I was enrolled on a master's degree course at Manchester University and I was beginning my investigations into how people may have made the ale in prehistory. In my final year as an undergraduate, I had chosen the British Neolithic and Bronze Age as my specialist subject. We were told that, in Bronze Age Britain- Beakers were for Beer! Warriors buried with wrist guards and bows and arrows and fine beaker pots for their ale! It got a laugh from the class, as any mention of beer and brewing seems to do. I'm still not sure why - but that was when I first began to wonder. "OK. So, how did they make it?" Being married to a craft brewer, I was used to living in a brew house. The sacks of crushed malt. The delicious aroma of the mash. The rituals. The water and wort spilled on the kitchen floor. Steam emanating from the out house door as he mashed the malt and boiled the wort. We lived in a big, old Victorian house and the dining room was where the beer was fermented. We had a cellar to keep it in. He would bring a sack of crushed malt in through the front door and transform it into beer. It was very good beer. It was a fairly simple process. I found nothing about how ale was made. Anywhere. There's my research topic, I thought. 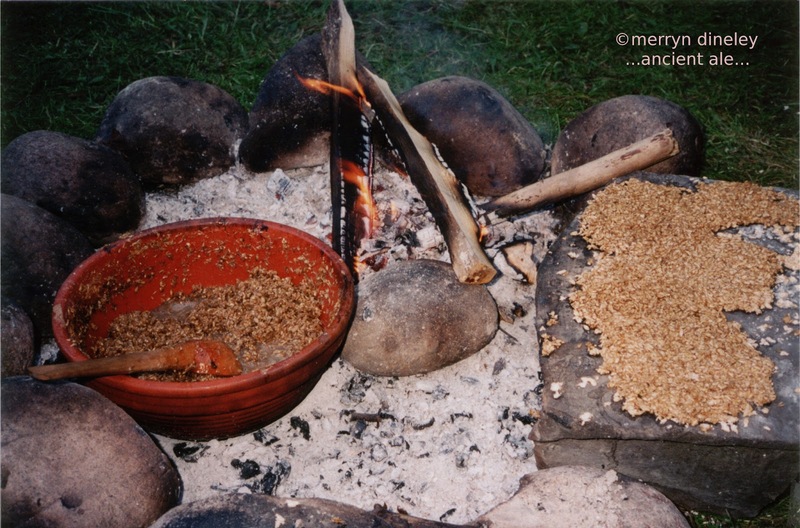 How did they make the ale in Bronze Age Britain? All the paper work was done, I was accepted as a Post Graduate student and I got a desk - nothing else, just a desk. In the late 1990s there were just a handful of computers in the Archaeology & Art History Department. None at all in the John Rylands University Library. But plenty of books, journals and excavation reports. So I applied myself to reading excavation reports and to understanding how ale is made. With three young children, it was always going to take a while. It would always be part time. Within a couple of months, reading about the organic residues described in excavation reports that had been identified on both Bronze Age Beakers and Neolithic Grooved Ware pottery, I realised that brewing might perhaps be a neolithic thing ... but more of that particular excitement another time. To make ale from the grain, you must transform it into sugars. Sugar ferments into alcohol, we all know that. The transformation of cereal into alcohol is done by heating up crushed malt with water to make a wort. That is what craft brewers do. But I had to use equipment that would have been available to a Bronze Age or a Neolithic brewer. So, all I needed was some crushed malt, an earthenware bowl and a fire. I took some of the household brewing ingredient - Maris Otter Pale Crushed Malt. I went to the local garden centre and bought an earthenware bowl. The bowl was heated, and sealed with beeswax. This is known, officially, as the saccharification. My craft brewer husband had been telling me, for months, that I had to understand the saccharification before I could understand the brewing process. Now that I had done it for myself, I understood it - at least superficially. Malted barley could be easily made into liquid malt sugars using simple equipment. All that was needed was water, crushed malted grain, the application of gentle heat and a heat proof and watertight container for the mash. But it was also possible to make malt sugars on a hot stone by the fire. As with any archaeological experiment, it had thrown up many new questions for me to consider. And my investigations into ancient ale were underway. Could these be the so called "beer bread" of the Egyptians or the "bappir" of the Sumerians? How far back did this fundamental technology go? What is so special about the malted grain that you could make sugars from it? I had lots and lots to learn yet!